I’ve been experimenting with several writing/reporting projects, the most recent is requiring my news ethics and responsibility class to write op eds about their communities and the sources that they use to know what’s going on in their communities as well as staying on top of important local, city, state, national and international issues. It’s been an interesting learning experience for me, and will be influencing my writing/reporting classes in the future. The project, Who Needs Newspapers?, can be found in the Newspapers Dying? No Big Deal to These Students. A Phishing Episode: D.C. Teachers F.C.U. Notification From D.C. Teachers F.C.U. At D.C. Teachers Federal Credit Union, the highest responsability to our customers is the safekeeping ofÂ confidential information you have entrusted to us and using it in a responsable manner. A fundamentalÂ element of safeguarding your confidential information is to provide protection against unauthorized accessÂ or use of this information. We maintain physical, electronic and procedural safeguards that comply withÂ the federal guidelines to guard your nonpublic personal information against unauthorized access. At this time we need you to confirm your e-mail address with our existing database. As soon as ourÂ database will be updated we need to make few important announcements to our customers so pleaseÂ update your contact information with no delay. Just finished watching the Sarah What’s-Her-Name segment of CNN’s Reliable Sources, an excellent show for a genre purporting to broadcast insightful commentary and analysis and news about news. Sometimes, however, the difficulties of producing a regular schedule of quality programming for this genre is evident â€“ slow news week, bad news week â€“ and banality can rule at times. Nothing insightful this date, November 22. Nothing new, nothing gained. 1) First WORD Blog post about the death of UWIRE. 2) UWIRE General Manager Tom Orr criticizes WORD Blog post. 3) Chastised for alleged mistakes in a post, WORD Blog does the mea culpa. UWIRE ran out of $$$. So, why all the earlier secrecy and subsequent growling when this humble site was trying to find out what had happened? 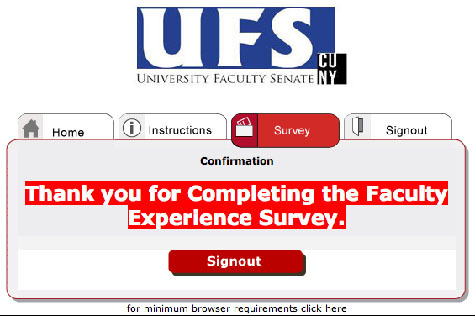 I whisked through questions to complete the survey even as the questions were raising more questions. Like this one, Question 5f: Level of Respect Shown to Faculty by College President. Should there have been a similar question about department chairs? You are currently browsing the The WORD Blog blog archives for November, 2009.